For many years, I wanted to read Margaret Atwood's novels (so many books, so little time!). I finally read her best-known book, The Handmaid's Tale, last summer and thoroughly enjoyed it. So, I was glad when my book group recently chose another Atwood novel, Alias Grace, for our March selection. A historical novel, it was completely different from her famous dystopian tale but just as compelling. Alias Grace is based on the true story of Grace Marks, a young woman in Ontario accused of murder in 1843 and sentenced to life in prison at the tender age of sixteen. 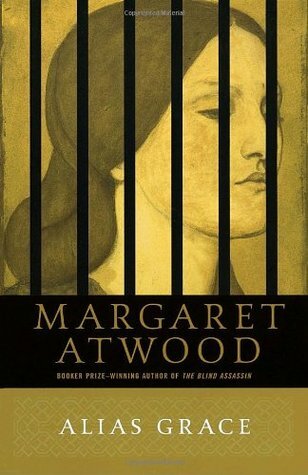 Atwood's novel begins during Grace's time in prison, as she walks with guards every day to the warden's house to help his wife and the servants with household duties. Grace's story unfolds slowly over the course of the novel, with some chapters from Grace's first-person perspective, some chapters consisting of letters sent back and forth between various characters, excerpts from real-life news stories printed at the time, and some chapters from the third-person perspective of a young doctor named Simon Jordan. Dr. Jordan specializes in mental health (though it was not known by that name at that time) and hopes to one day revolutionize insane asylums by providing them with the basics of human health (clean water, no open sewage, etc.) He has traveled from the U.S. to Canada to interview Grace, in the hopes of finding a way to help her recover lost memories from the day of the murders. As Simon and Grace talk each day, starting from Grace's earliest memories, her story slowly emerges, from her difficult childhood filled with loss to beginning to work as a servant at the age of thirteen and eventually, to that fateful day of the murders. This was an excellent novel for a book group, with so much depth and so many different layers to discuss. The biggest question in the novel is whether Grace was guilty and how much of a role she played in the famous double-murder. Her male counterpart was hung for his role in the murders - was Grace forced to help him or was it her idea in the first place? Is she a victim herself, a cold-blooded killer, or insane? These questions underlie the entire narrative, as the reader learns more and more about Grace and her life, while Simon brings her ever-closer to the black hole in her memory. This is not just a murder mystery, though. It is also a full and captivating story about life in the mid-1800's, perfect for anyone who enjoys historical fiction. Atwood brings this 175-year old story to vivid life with her engaging prose and alternating viewpoints, with further depth added by the actual news reports, poems from the time about Grace, and even quilt patterns at the beginning of every section that relate to the story. I thoroughly enjoyed this engrossing novel, as did most of the other members of my book group...though we still could not agree on whether Grace was guilty or innocent! Disclosure: I received this book as a personal gift. My review is my own opinion. Or order Alias Grace from Book Depository, with free shipping worldwide. I haven't heard of this one, but it sounds so good! It was new to me, too, and I liked it more than I expected to! I remember reading this years ago...my first Atwood---and I desperately wanted to discuss it with someone. The length seems a bit prohibitive for a book club selection. Did all your members finish it by the meeting? No one even mentioned the length, Anne - certainly no complaints! Despite the length, it is actually a quick read - good flow and very compelling - so the length wasn't an issue. And, yes, it was great for discussion! !